Jason Boyett's latest book is one of those books that you shouldn't judge by it's cover. Granted, the cover art is awesome. But by looking at it, you might have some preconceived notions. For example, you might be thinking, "This probably is one of those quasi-sarcastic, David Sedaris-esque, Donald Miller-ish books of essays written by a snarky but sweet Christian author, who struggles with faith and finds it in the most unexpected places." Okay, you wouldn't be far off---and neither was I, because that's what I thought when I first ordered the book. I happen to like snarky but sweet, and I struggle with my faith, too. So those kinds of books do it for me. Boyett is a blogger and author who now has hit the blogging big time by being featured on Beliefnet with other Christian "luminaries" like Diana Butler Bass, Scott McKnight and Tony Jones. He is also the author of the Pocket Guide to the Afterlife and Pocket Guide to the Bible. 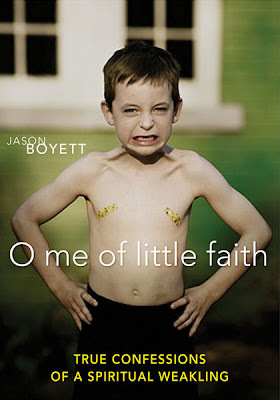 O Me of Little Faith is a manifesto for doubters. In fact, it's probably one of the most accessible books on doubt as it relates to faith, God, Christianity, etc. that I have ever read. Boyett translates much of the postmodern debates on God and the Church into easily understood terms, and he gives a voice to all of us who continue to find gaps and broken places in our theology. I found myself hearing the echoes of theologian/philosopher/madman Peter Rollins in Boyett's writing--without Rollins' difficult analogies and uncomfortable language. In a nutshell, Boyett (and Rollins) assert that one of the most faithful things that we can do as followers of Christ is to express our doubts. I happen to agree. What I love about O Me of Little Faith is the way that Boyett allows himself to stand between the tension of the "now" and the "not yet" when it comes to understanding faith. In other words, he's okay with mystery and admits that sometimes the only thing we can do is say as a man once exclaimed to Jesus, "I believe... help my unbelief!" I fully intend to keep a supply of these books on hand to give to people I encounter who are struggling to find their way out of the Christian ghetto that we create (where we only deal with other Christians, listen to Christian reasoning, music, discourse, etc.) out of our need for safety and security.